Few people are having a good day when they go looking for a lawyer (unless they have just won the lottery). Even those who are simply creating wills, drawing up contracts, or setting up businesses are dealing with scenarios designed to cause a certain amount of trepidation. Almost any time you're dealing with the law you're addressing some sort of major life event. This means clients are nervous, and, in turn, means reviews are huge for every legal firm. Law firms face two major review management challenges. Some clients won't want to advertise they needed a lawyer's services, especially if their problem was a criminal matter. This means lawyers will have to work twice as hard and be twice as vigilant about seeking reviews. Members of the legal industry are bound by some pretty intense rules about what they can and cannot say in their advertising. These ethics rules cover both how a lawyer asks for reviews (a simple request is all that's allowed) and review management itself. For example, while you can't control whether a client breaks the ethics of attorney advertising in a review, one has to stay on top of them when trying to market a law firm. While other industries often use a site's ability to respond to a review to deal with bad reviews, you might well have to devote that time and space to making clarifying statements which keep you in the clear. "Thanks for the endorsement! No law office can guarantee results, and we certainly don't, but we can guarantee we'll always work hard to bring your case to a successful conclusion." This, of course, requires you to catch reviews on all major sites as soon as someone leaves one. See also: The Rules of Sharing Reviews in the Legal Industry. It's where the vast majority of While the vast majority of a law office's reviews should. Reviews are the number one local listing ranking factor, and the more of them you have the better your chances of appearing at the top of local search results. As a bonus, many of your clients will already have existing Google accounts, which removes a barrier to writing up a review. It doesn't hurt to also funnel some recommendations and reviews toward Facebook and Yelp (yes, people will actually search for lawyers on Yelp). Keep in mind you don't have to participate in the advertising services these platforms offer to claim your profile, but that’s a whole other can of worms that may or may not be worth your time. 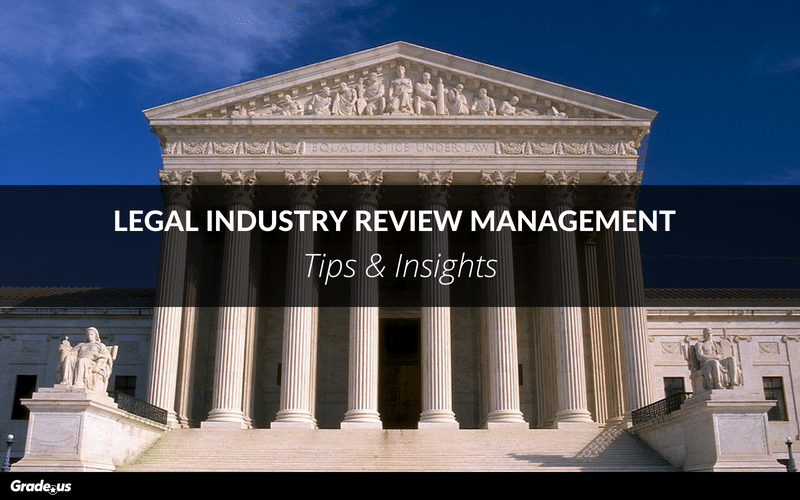 Lawyers have two primary opportunities to ask for a review. Opportunity #1: After the client's case has been brought to a successful conclusion. Got the client an outcome he or she is happy with? Once the client has expressed his or her happiness, a simple ask is often all it takes. You've taken the time to grow a relationship with this person, which means a face-to-face ask is appropriate. It's also the best way to get amazing reviews. Since most clients are probably either on Google or Facebook you can suggest one of those two platforms at this time. Lawyers will want to be careful about handing out cards which suggest review sites as this could be construed as an ethics issue. Opportunity #2: Later, with the use of an email drip campaign. If you don't get the chance to ask the client for a review right after the case a conservative email drip campaign offers a nice follow-up opportunity. This also offers the opportunity to funnel customers to sites like Avvo and Lawyers.com. You don't want to get crazy with this. Send an email one day after you've closed the case, 3 days later to follow-up, and 7 days later as a final reminder. Will this lawyer really have my best interests at heart, or will he or she purposefully draw the case out longer than necessary to get more of my money? Does this lawyer really know what he or she is doing? Does this lawyer care about me at all? Will this lawyer leave me in the poor house? The best reviews will alleviate all or most of these fears. Here's an example. The lawyer proved he had the client’s best interests at heart because he was honest and upfront about his fees. His fees were also reasonable, which tells future clients they may be able to afford this attorney. He was able to negotiate a fair and equitable divorce settlement, so he knows what he’s doing. He provided an incredible amount of emotional support while remaining calm, reassuring, and professional, proving he cares. While it might have been nice to have the reviewer's name and photo this isn't a huge concern for a law office review. As mentioned, privacy is often a big concern for clients, who might not want to splash their legal matters all over the Internet. People who are shopping for a lawyer tend to feel the same way and in general won't be put off by an anonymous review. They won't all be anonymous. Sometimes you'll get a rousing endorsement from someone really credible, like a Google Local Guide. Sadly, there's not much an attorney can do to try to achieve these sorts of reviews other than delivering top-notch service. Even using language in an email which asks clients to address specific aspects of the legal services they received could call the lawyer's ethics into question. The best you can do is to keep these four points firmly at the top-of-mind whenever you handle a client. If you meet these four concerns you should get reviews to reflect your excellent work. For lawyers, there's one last hurdle to gathering great reviews. Many attorneys feel extremely awkward about the entire process. This is a mindset issue, and one that's hard to get over. It’s an older, more traditional and conservative industry, where explicitly asking for a review feels tacky. After all, gaining 5-star reviews on online sites might seem to clash with the image of a conservative, dignified attorney. All you can do is remind yourself this is the modern legal marketplace at its finest. All of your peers are having to do the same thing. So, practice making that ask with confidence! If you feel awkward the client may feel awkward too, which could cheat you out of reviews which might have really allowed your law office to thrive. Just think of it this way: the more reviews you get, the more people you'll ultimately be able to help with your outstanding legal services.